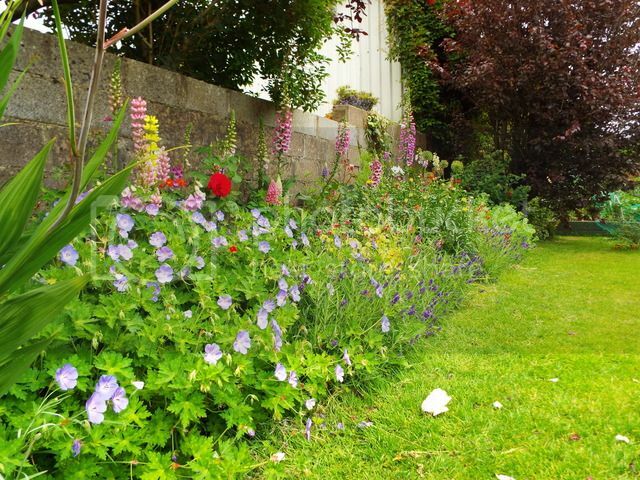 It's hard to get a border to look good throughout the year, especially if it is very visible from, say a sitting room or front entrance. But it is worth while making the effort. I would consider pruning back some of the existing shrubs and trees to let better light in, especially towards the back of the border. Look at examples of 'raising the crown' of trees. Try to include some plants that will give winter structure, either evergreens or plants with a strong shape to their stems, or long-lasting seed heads. And do consider the potential for bulbs to bring colour from snowdrops in January through crocus, daffodils, tulips, alliums, to lilies in July. There are loads in the shops right now and many could be started off in pots to be planted out later when you have your perennials sited. Thanks for those replies folks - lots of interesting suggestions. The bed is cleared out of shrubs two week ago and I've planted some alliums, snowdrops and daffofils. 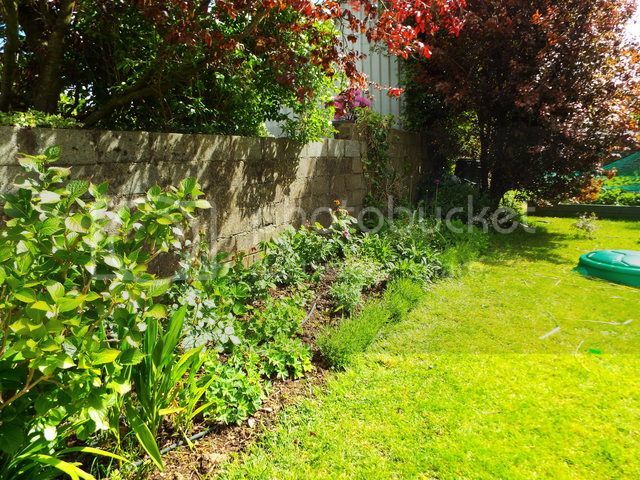 Only the front edge of the bed is visible from the house - its really only during May - Aug, when we are in the garden that it needs to look good so I'm not too worried about iuts appearance during the aut - winter. I have bought some Lavendar to plant at the front of the bed to give it some structure. I'll keep updating (and looking for tips!) as I progress. All the best with the project. Looking forward to updates. Just remember lavender needs loads of sun and very free-draining soil or it sulks. I know, I've tried, countless times. I've planted a few Rose bushes in the border now and plan on putting in more perennials over the next few months. With a view on keeping costs under control, I picked up some bare root perennials (Lupins and Phlox) in Aldi. I've soaked these and potted them and they are next to the window in the shed. Leave them outside in a place where they will get rain and good light. But avoid direct sun or the pots may dry out too easily.. let them stay in the pots until they are growing strongly - they need to develop a good rootball before you plant them.. Both plants are tough as old boots so don't worry about a bit of frost. You are right about the slugs! You could apply a band of grease (Vaseline?) an inch or so wide below the tops of the pots or you could buy some copper anti-slug adhesive tape to do the same. Good hygiene in the area where the pots are will help and you can back this up with a small handful of organic slug pellets (which need to be replenished after rain). I also use crushed shells, holly leaves etc as "slug-discouragers" and try to ensure a good supply of slug predators. Brightens up the garden nicely. The rose bushes at the back of the border are very low still so the roses tend to be covered by the flowers in front of them. Once they're taller I think it will look better. 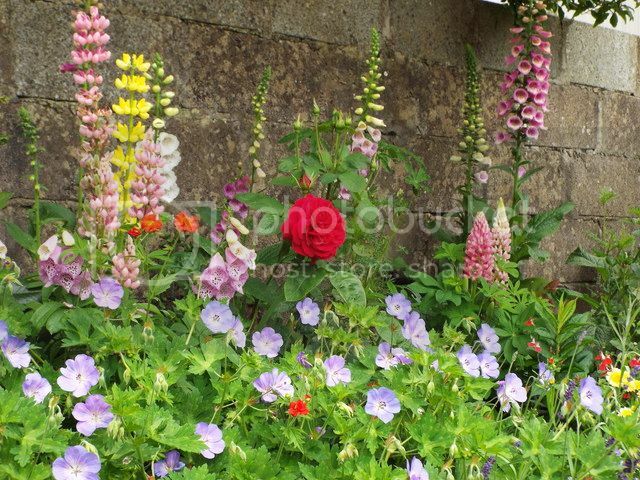 Also thinking for next year I might plant climbers on the wall at the back. Wow, that's a very satisfying splosh of colour, and everything looks so healthy! My lupins have been a martyr to mildew this year and with all the soil disturbance the self-sown foxgloves have failed completely. I'm jealous! That's good, CG. I'm not much into flowers myself, but am glad to have done a little to improve things. All he best. Well done, cg! A lovely show - you must be delighted to have such a reward for your efforts. Brilliant.